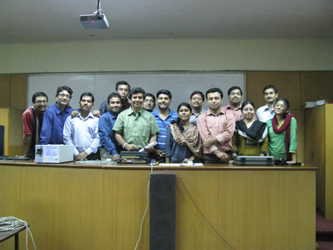 November 22, 2012, Wednesday, Jadavpur University, Kolkata, India. 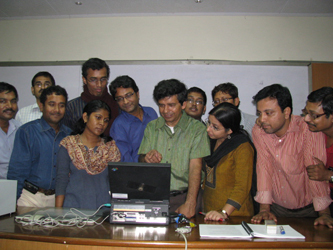 Laser animation courses at Jadavpur University continue to run full speed. Today was the third session with Manick Sorcar as the instructor, who initiated the course last year at the Illumination Engineering and Electrical Engineering division of Jadavpur University. The second session took place a day earlier on November 21, where art and animation aspects of this course were covered. 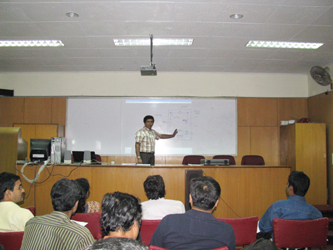 In today’s session he explained and demonstrated how a computer programming was used to build animation frames, scenes, and eventually, a show. Each student was given the opportunity to create their own animation character on computer, digitize it, and load it for laser projection. The event was of special significance to the students and the university as it was the very first laser animation class-project where the students jointly created a show of their own. The session ran for 3 hours.